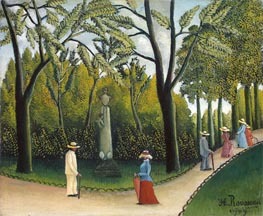 Henri Rousseau (May 21, 1844 - September 2, 1910) was a French Post-Impressionist painter in the Naive or Primitive manner. He is also known as Le Douanier (the customs officer) after his place of employment. Ridiculed during his life, he came to be recognized as a self-taught genius whose works are of high artistic quality. He was born in Laval in the Loire Valley into the family of a tinsmith. He worked for a lawyer and studied law, but "attempted a small perjury and sought refuge in the army," serving for four years, starting in 1863. With his father's death, Rousseau moved to Paris in 1868 to support his widowed mother as a government employee. With his new job in hand, in 1869 he started a relationship with a cabinetmaker's daughter, Clemence Boitard. In 1871, he was promoted to the toll collector's office in Paris as a tax collector. He started painting seriously in his early forties, and by age 49 he retired from his job to work on his art. Rousseau claimed he had "no teacher other than nature", although he admitted he had received "some advice" from two established Academic painters, Felix Auguste-Clement and Jean-Leon Gerome. Essentially he was self-taught and is considered to be a naive or primitive painter. His best known paintings depict jungle scenes, even though he never left France or saw a jungle. Stories spread by admirers that his army service included the French expeditionary force to Mexico are unfounded. His inspiration came from illustrated books and the botanical gardens in Paris, as well as tableaux of "taxidermified" wild animals. To the critic Arsene Alexandre, he described his frequent visits to the Jardin des Plantes: "When I go into the glass houses and I see the strange plants of exotic lands, it seems to me that I enter into a dream." Along with his exotic scenes there was a concurrent output of smaller topographical images of the city and its suburbs. He claimed to have invented a new genre of portrait landscape, which he achieved by starting a painting with a view such as a favourite part of the city, and then depicting a person in the foreground. He painted in layers - starting with a sky in the background and ending with animals or people in the foreground. The rain in Tiger in a Tropical Storm (Surprised!) of 1891 (National Gallery, London) is achieved in an innovative way with thin light grey strands of paint slanting across the canvas with a glaze or varnish. The effect was influenced by the artist's "lifelong admiration for the satiny finishes of Bouguereau". When Rousseau painted jungles he could use over 50 varieties of green. Although derived from nature, his foliage is adapted to his artistic needs and no longer recognisable as particular plants. He worked on each painting for a considerable length of time and consequently his color is not extensive. Rousseau used a student grade of paint because of his financial limitations. In some paintings certain areas of overpainting, e.g. foreground foliage, is now badly cracked, due to incorrect technical procedure (although this is not uncommon in oil painting and can be seen in works by Matisse and Picasso). 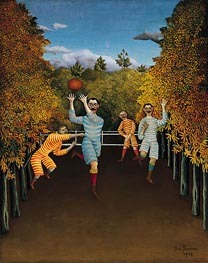 Rousseau's naive style gave him many critics: people often were shocked by his work or ridiculed it. His ingenuousness was extreme, and he was not aware that establishment artists considered him untutored. He always aspired, in vain, to conventional acceptance. Many observers commented that he painted like a child and did not know what he was doing, but the work shows sophistication in his particular technique. From 1886 he exhibited regularly in the Salon des Independants, and, although his work was not placed prominently, it drew an increasing following over the years. Tiger in a Tropical Storm (Surprised!) was exhibited in 1891, and Rousseau received his first serious review, when the young artist Felix Vallotton wrote: "His tiger surprising its prey ought not to be missed; it's the alpha and omega of painting." 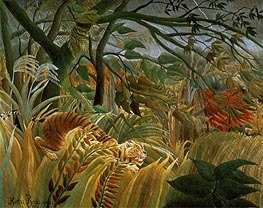 Yet it took more than a decade before Rousseau returned to depicting his vision of jungles. In 1905 a large jungle scene The Hungry Lion Throws Itself on the Antelope was exhibited at the Salon des Independants near works by younger leading avant-garde artists such as Henri Matisse in what is now seen as the first showing of The Fauves. Rousseau's painting may even have influenced the naming of the Fauves. In 1907 he was commissioned by artist Robert Delaunay's mother, Berthe, Comtesse de Delaunay, to paint The Snake Charmer. When Pablo Picasso happened upon a painting by Rousseau being sold on the street as a canvas to be painted over, the younger artist instantly recognised Rousseau's genius and went to meet him. In 1908 Picasso held a half serious, half burlesque banquet in his studio in Le Bateau-Lavoir in Rousseau's honour. After Rousseau's retirement in 1893, he supplemented his small pension with part-time jobs and work such as playing a violin in the streets. He also worked briefly at Le Petit Journal, where he produced a number of its lurid covers. Rousseau's work exerted an "extensive influence ... on several generations of vanguard artists, starting with Picasso and including Leger, Beckmann and the Surrealists," according to Roberta Smith, an art critic writing in The New York Times. "Beckmann’s amazing self-portraits, for example, descend from the brusque, concentrated forms of Rousseau’s portrait of the writer Pierre Loti". Some of Picasso's abstract people resemble the "childish" style said to be in Rousseau's paintings, and the younger painter's Demoiselles d’Avignon, Smith wrote, is "a work that they surely influenced". His work The Sleeping Gypsy (1897), which shows a lion musing over a sleeping woman in eerie moonlight, is one of the best-known works of the modern era. 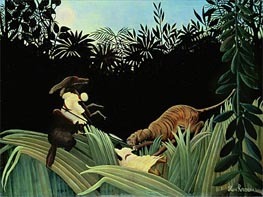 The cover illustration for Fleetwood Mac's Tango in the Night album is Homage a Henri Rousseau by Brett-Livingstone Strong, based on Rousseau's The Snake Charmer. In the early 1970s, the musical group Slapp Happy referred to their quirky style of pop song as "naive rock, the Douanier Rousseau sound." This may be taken as both an homage to the painter and a tongue-in-cheek jab at academic music criticism. 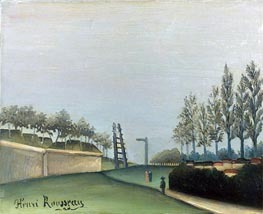 In 1911 a retrospective exhibition of Rousseau's works was shown at the Salon des Independants. His paintings were also shown at the first Blaue Reiter exhibition. Two major museum exhibitions of his work were held in 1984-85 (in Paris, at the Grand Palais; and in New York, at the Museum of Modern Art) and in 2001 (Tubingen, Germany). "These efforts countered the persona of the humble, oblivious naif by detailing his assured single-mindedness and tracked the extensive influence his work exerted on several generations of vanguard artists," critic Roberta Smith wrote in a review of a later exhibition. 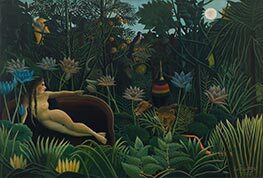 A major exhibition of his work, "Henri Rousseau: Jungles in Paris," was shown at Tate Modern from November 2005 for four months, organised by the Tate and the Musee d’Orsay, where the show also appeared. The exhibition, encompassing 49 of his paintings, is running at the National Gallery of Art in Washington from July 16 October 15, 2006. 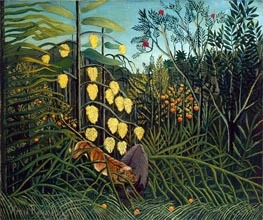 A major collection of Rousseau's work were shown at The Grand Palais from March 15 to June 19, 2006.